Elie Wiesel—writer, professor, political activist, Nobel Laureate and Holocaust survivor— said, “The opposite of love is not hate, it’s indifference.” It is difficult to be indifferent after a visit to the United States Holocaust Memorial Museum (USHMM) in Washington, DC, as I learned during my family summer road trip. Three seniors, two teachers, and two children piled into a rented minivan for a thirteen-hour road trip to Washington in early August. Our main destination was the Holocaust museum; little did we know that the plan to fulfill my father’s dream of visiting the memorial to Holocaust victims would turn out to be an extraordinary experience for all of us. The impressive architecture of the museum, designed by architect James Ingo Freed, was evident before we even entered the main doors. On the main floor, the Hall of Witness, red brick walls in the pattern found in Auschwitz, as well as heavy slate-grey beams give the sense of being in a prison. A wide staircase leading to an entrance echoing the arches in Auschwitz brings visitors to the permanent exhibition. On one end of the hall, a large slate wall is etched in white block letters: “You are my witnesses. Isaiah 43:10.” The architecture is at once oppressive and hopeful as the sun bounces off the four-story atrium walls and steel railings of the staircase, flooding the hall with natural light from the glass and steel-beamed skylights arranged in a slightly askew formation, suggesting the imbalanced state of Europe during the time period. The result is a highly conceptualized structure that balances a sombre quality with awe-inspiring beauty. The most moving experience of the visit was encountering two Holocaust survivors: Nesse Godin and Regina Spiegel. We quickly learned that Nesse and my father Aarne were both sixteen when they were imprisoned in the same concentration camp. After only minutes of being in the museum, the tears were beginning to flow, but smiles were equally evident. Meeting a fellow survivor was a priceless moment for my father: “It [the museum] is really, really good. Very well done. Especially the people who were there. It brings the memories back right away.” Nesse, Regina and other survivors regularly volunteer their time to discuss their experiences with visitors, providing the unique insight of first-hand accounts. Perhaps it was a coincidence that we arrived on a day Nesse was there, but I think it was fate. The main exhibition areas provide detailed information alongside authentic artifacts, photography and video from the Nazi era. Unlike a traditional museum that seeks to preserve and display objects, the USHMM is a narrative history museum. The displays tell a story in the historical context, and allow the visitor to identify with the people and events both emotionally and intellectually. Bunk beds from the barracks of Auschwitz, a Danish boat that rescued Jews from Denmark, Nazi uniforms and prisoner clothing, and a replica of a crematorium from Mauthausen are just a few of the artifacts that help to tell the story. Thousands of shoes piled behind glass remind us that each pair once had an owner. A glass corridor overlooking the Hall of Witness is etched from floor to ceiling with the names of Jewish communities decimated by the Holocaust, while a second corridor gives the thousands of first names of those who perished. The oral testimony film in the amphitheater expresses the loss and anguish experienced by the survivors in a most moving manner. Viewing the Polish railway car, the same type that transported my father and his shipmates from Danzig Bay to Stutthof, was a particularly poignant moment for both me and my father. The Hall of Remembrance—a large, bright, hexagonal space—houses the Eternal Flame to commemorate the victims of the Holocaust. On the walls around the room, the names of the concentration and death camps are etched. Below the names, rows of candles flicker. It is a solemn place of reflection, but its skylight provides a sense of hope rather than despair. 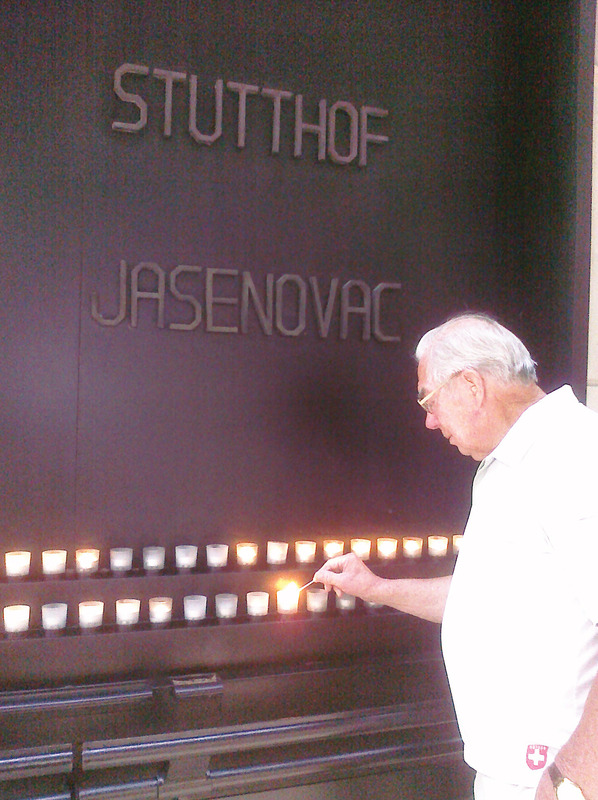 Under the inscription for Stutthof, my father paused to light a candle for all those who lost their lives at Stutthof. The museum opened a window for me, shedding light on my father’s experiences as a survivor of Stutthof Concentration Camp. His Finnish merchant marine ship was captured in October 1944, and he, along with approximately ninety other Finnish sailors, was imprisoned in Stutthof, the first concentration camp built outside of Nazi Germany. His personal accounts of life in the camp, forced labour, the Death March, naval evacuations and liberation came alive as we wandered through the exhibits together. As the gatherer of my father’s stories, I appreciated the importance of the museum in preserving family histories, as so many eyewitnesses of the Holocaust have done through their personal narratives and donations of historic items to the museum. I hesitated about bringing my children to the museum, but felt compelled to have them experience its offerings because of their Pappa’s history. My concerns were put to rest as they explored the children’s exhibition, “Remember the Children: Daniel’s Story.” The exhibit, suitable for elementary and middle school children, introduced them to many difficult, yet important issues in an age-appropriate manner. When asked whether other kids should visit the museum, my nine-year-old son Kieran said, “Yes, because it is a good way to learn about what happened in the past and what is happening now in the present.” The seeds of empathy are indeed planted as children learn through the stories of others. As we piled back into our minivan for the long trek home to Sudbury, Ontario, I reflected on the lessons the Holocaust museum had taught us. I am eager to share what I have learned with my students and I am overwhelmed by the experience I shared with my father and children. The same seven people did not enter the minivan: each one of us was forever changed by the brick and glass building, and the amazing people who work and volunteer within its walls. We are already looking forward to returning to Washington as the museum celebrates its twentieth anniversary on April 28 and 29, 2013. Our experiences at the United States Holocaust Memorial Museum left us far from indifferent and its lessons from the past will continue long into our futures. Liisa Kovala is the Program Leader of English at Lockerby Composite School in Sudbury, Ontario. She has an English (Honours) degree and a Bachelor of Education from Ottawa University, a Master of Education from Nipissing University and is pursuing a Certificate of Creative Writing from University of Toronto. Liisa is currently working on a book about her father’s experiences during the Holocaust.